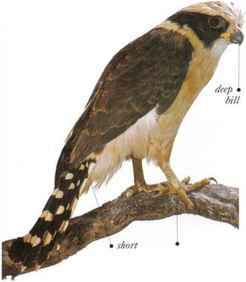 A large and heavily built forest falcon, this bird is recognized by its stiff crown feathers that form a bushy crest above a dark face mask. Its name refers to the laughing call it utters when disturbed, although at other times its call is a single or double note repeated many times. A sluggish species, it spends most of the time perched in a tree watching the ground for prey. Snakes are its main food, and the falcon swoops down and pounces heavily on its victim, biting it behind the head or biting the head off. The snake is then carried to a perch, either in the feet or the bill, to be eaten. 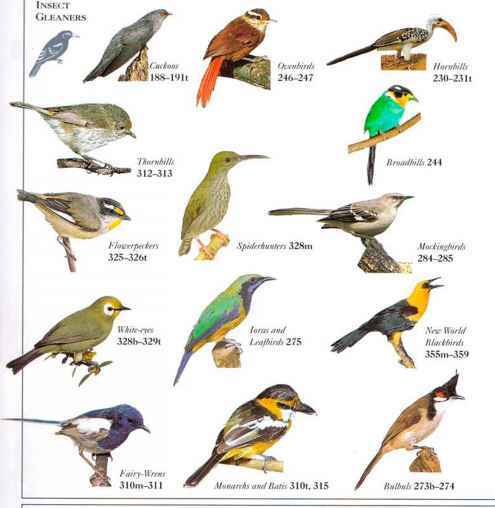 The Laughing Falcon also eats lizards, small mammals, and invertebrates. It flics infrequently, with rapid wing flaps alternating with level glides, and rarely soars. • NliST A tree hollow, or a disused bird nest. • remark Females arc larger than males.